↑ (2015) The 2014 Myanmar Population and Housing Census Highlights of the Main Results Census Report Volume 2 – A. Department of Population Ministry of Immigration and Population. 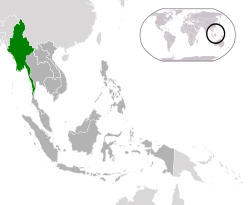 ↑ 3.0 3.1 Burma (Myanmar). World Economic Outlook Database. International Monetary Fund. ↑ "Asian Development Bank and Myanmar: Fact Sheet" (PDF). Asian Development Bank. 30 April 2012. Archived from the original (PDF) on 26 November 2011. Retrieved 20 November 2012. ↑ "The World Factbook – Burma". cia.gov. Archived from the original on 4 November 2010. Retrieved 4 May 2016.